The Holding Ontology is a vocabulary to express (library) holdings in RDF. Connections to related ontologies are included wherever possible. The Holding Ontology deals with items and their relations to agents and documents. An item is a copy or exemplar of a document. Items are also referred to as holdings, but a holding is moreover the description of an agents inventory and access information for the item. Items may further be connected to services, locations, and chronologies. This document is an early draft, created by a DINI AG KIM Working Group. See https://wiki.dnb.de/display/DINIAGKIM/Bestandsdaten+Gruppe for more resources. The URI namespace of this ontology is http://purl.org/ontology/holding#. The namespace prefix holding is recommeded. The URI of this ontology as a whole is http://purl.org/ontology/holding. dct:creator "Carsten Klee", "Jakob Voß" . The holding ontology defines three classes Item, Agent, and Document based on existing classes defined in other ontologies. Relations between and properties of the holding classes are explained below as holding relationships and holding properties. An Item is a particular copy or exemplar of a Document. The holding ontology recommends to use class bf:HeldItem from the Bibframe Vocabulary, class frbr:Item from the FRBR Ontology or class rdac:Item from the RDA Vocabularies. owl:unionOf (bf:HeldItem frbr:Item rdac:Item) . An Agent is a person, organization, group or any other entity that can held items and provide services. The holding ontology recommends to use class foaf:Agent from the FOAF Ontology, class bf:Agent from the Bibframe Vocabulary, class schema:Organization from Schema.org or class rdac:Agent from the RDA Vocabularies. owl:unionOf (bf:Agent foaf:Agent schema:Organization schema:Person rdac:Agent) . A Document is a body of information used designed with the capacity (and usually intent) to communicate. A document may manifest symbolic, diagrammatic or sensory-representational information. Documents may include both abstract works, such as the story of “Romeo and Juliet”, and more concrete entities, such as a specific edition of a book. Abstract documents are exemplified by Items. Some documents, such as unique physical pieces of art, may also be be refered to as both abstract and concrete. For this reason the classes Document and Item are not disjoint. The holding ontology recommends to use class bibo:Document from the Bibliographic Ontology, class foaf:Document from the FOAF Ontology, class bf:Work or bf:Instance from the Bibframe Vocabulary or schema:CreativeWork from Schema.org. owl:unionOf (bibo:Document foaf:Document bf:Work bf:Instance schema:CreativeWork) . The holding classes can be connected by the following holding relationships to express collection (between documents and agents), possession (between items and agents), and exemplification (between documents and items). The main relationships are illustrated below. A Document can be collected or described by an Agent, for instance in a bibliography or catalog. The properties collectedBy and collects can be used to express this relationship. The properties can also be used for Items which are collected by an Agent. The sub-properties heldBy and holds should be preferred when an item is not only collected by description but also by possession. Relates a Document and/or Item to an Agent who collects the document or item by selecting, arranging, describing and/or cataloging it in a collection. This property may coincode with rdai:collector from RDA Vocabularies. Relates an Agent to an Item and/or Document that is collected by the agent. This property may coincode with rdaa:collectorOf from RDA Vocabularies. Relates an Item to an Agent who holds the item. This property may coincide with rdai:owner or rdai:currentOwner from RDA Vocabularies. The heldBy property is a sub-property of collectedBy: an item that is held is also collected by the same agent. Relates an Agent to an Item which the agent holds. This property may coincide with rdai:ownerOf or rdai:currentOwnerOf from RDA Vocabularies. The holds property is a sub-property of collects: if an agent holds an item that the agent also collects the item. The exemplar relation is used to state that a concrete Item is a copy of an abstract Document. Additional relations exist for items that only contain parts of a document and for items that contain multiple documents (for instance a collection that the document is part of). Given a book series (a Document), a full shelve of books of the series (an Item) is an exemplarOf the series. A book of the series (a Document) has a copy of the book (an Item) as exemplar. a broaderExemplarOf a single chapter of the book (as Document). Relates a Document to an Item that is an exemplar or copy of the Document. This property may coincide with frbr:exemplar from the FRBR Ontology and rdam:exemplarOfManifestation from RDA Vocabularies but the holding ontology does not imply a “manifestation” class. An exemplar should include all parts of a document but there may be gaps and omissions. See Chronology for examples. If an exemplar only includes parts of a documents that can be identfied as other documents, one should better use property narrowerExemplar. Relates an Item to the Document that is exemplified by the item. Relates a Document to an Item that contains a part of the document as exemplar. Relates an Item to a Document which is partly exemplified by (exemplarOf) the item. Relates a Document to an Item that is an exemplar of a part of the document. A call number, shelf mark or similar label of an item. A Chronology is the description of enumeration and chronology of a periodical. The Chronology class is defined by the Enumeration and Chronology of Periodicals Ontology. A Location is a point or area of interest from which a particular Item or DocumentService is available. The property gr:availableAtorFrom should be used to indicate the location of an offered DocumentService for an Item. The Location class is defined by GoodRelations. A DocumentService is a service that is related to one or more documents. The service involves a service provider (e.g. a library) and an optional service consumer (e.g. a library patron). Both service provider and service consumer SHOULD be instances of Agent. 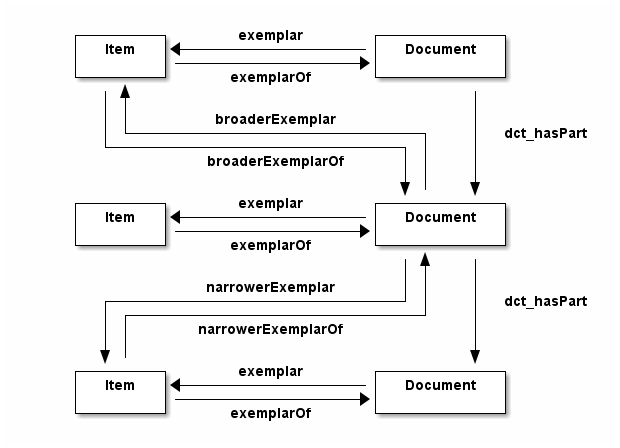 The DocumentService class is defined by the Document Service Ontology. To relate an Item to a Chronology use ecpo:hasChronology or ecpo:hasChronologyGap. To be more specific on the nature (current or closed) of a Chronology use ecpo:CurrentChronology or ecpo:ClosedChronology. To simply express the fact that an Item has a current chronology or a closed chronology without giving further information one MAY use ecpo:Current or ecpo:Closed. An Item may be available for a specific DocumentService. While an Agent provides a DocumentService for an Item this often implies an offer (gr:Offering and/or schema:Offer) to an unknown Agent. To relate an Item to a DocumentService one should use the properties dso:hasService, daia:availableFor or daia:unavailableFor. To relate a DocumentService to an Item one should use the properties dso:hasDocument, daia:availableOf or daia:unavailableOf. When a DocumentService is offered for an Item, one should use the property gr:name from GoodRelations to name the location where the DocumentService should be provided. The property gr:availableAtOrFrom from GoodRelations should be used to relate an offering of a DocumentService for an Item with a Location. The property service:providedBy from the Service Ontology should be used to relate a DocumentService with an Agent who offered the service. The property org:siteOf from Organization Ontology should be used to relate a Location with an Agent if the location belongs to the agent. Enumeration and Chronology of Periodicals Ontology (ECPO). dct:hasPart $volume1, $volume2, $volume3 . $volume1 a bibo:Book ; bibo:volume "1" . $volume2 a bibo:Book ; bibo:volume "2" . $volume3 a bibo:Book ; bibo:volume "3" .